© 2001 Artists Rights Society (ARS), New York, New York/ ADAGP, Paris, France. Photograph by R. H. Hensleigh. In 1962, while aimlessly doodling as he talked on the phone, painter Jean Dubuffet became intrigued by the capacity of his ball point pen (a relatively new invention) to create a continuous uniform line free of the stops and starts of ink or paint. 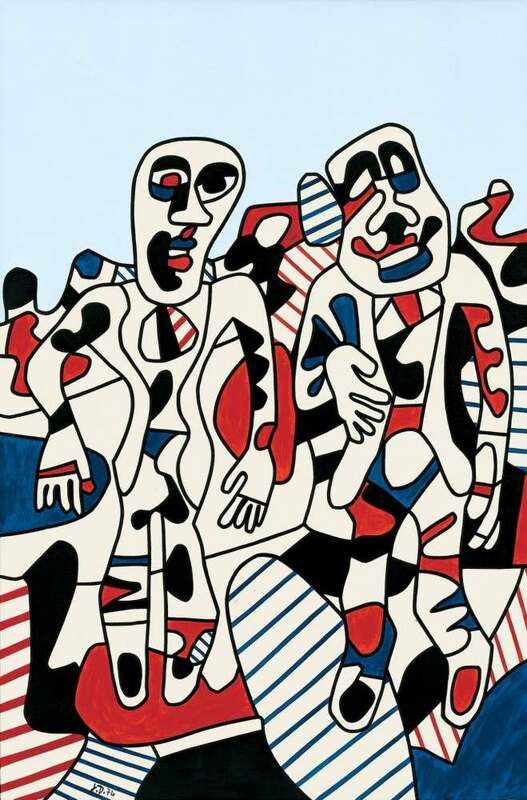 Dubuffet subsequently devised a sinuous network of jigsaw-puzzle-like forms that obscured distinctions between figure and surroundings, and adopted the tricolor palette of ball point pens of the era—black, blue, and red. Once expanded from their origins as paper doodles to large-scale canvases, Dubuffet dubbed these dense, interlocking compositions L’Hourloupe—which he defined as “a word whose invention was based upon its sound. In French, these sounds suggest some wonderful or grotesque object or creature, while at the same time they evoke something rumbling and threatening with tragic overtones.” This became a new and obsessive vocabulary for the artist for the next twelve years. The L’Hourloupe painting Promenade à deux (which translates to Two Persons Walking) executed in vinyl on canvas to mimic the flat, smooth surface of its ball pen source, presents two men walking toward the viewer. Though similarly attired in suits and ties or cravats, each differs from the other physically (with the exception of their bald pates) and in personality. The dapper, wasp-waisted fellow on the left, arms dangling stiffly beyond his body, complements the seemingly more genial, animated, but perhaps overbearing friend at the right. The latter seems to be gesturing toward the observer while cocking his head to the left in friendly, vigorous greeting. Though apparently quite singular as individuals, their promenade à deux implies that they are at least companionable opposites.